In a recent scramble to find new music, I signaled in my Facebook friends for some suggestions. There were SO many good jams, that I’ll be able to share them with you for weeks moving forward. Usually you come across bands whose style has been forced into some box that is a genre. Then only certain people enjoy that music because they are fans of that genre. It can get rather boring and you start to hear copy cat bands to the point where you don’t know if you’re listening to Creed, Nickelback or 3 Doors Down. If you currently have any of these on your iPod – even if you’re trying to be ironic – the mere chance that they might come up on shuffle means you need serious help. It’s like musical Russian Roulette and eventually that awful music is going to ruin your ears. 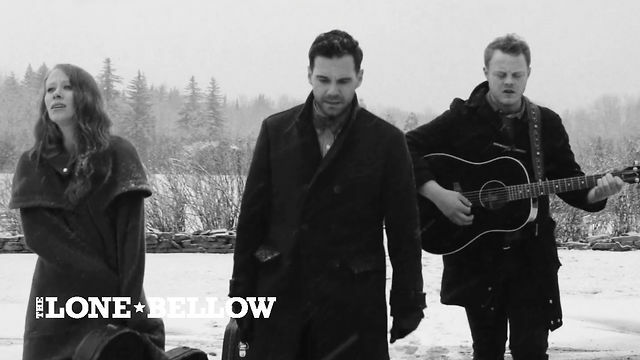 Now enter The Lone Bellow. Thanks to my good friend Sara V. who tends to be on the edge of new music, so naturally I knew I was in for a treat. As I’m prone to do, the whole song I’m trying to fit this song into some genre. Is this country? Is it folk? Is it soul? Is it bluegrass? All to finally realize its in a league of its own. Somehow it manages to be all of the above and then some with complete grace. The band features 6 members in this video, 4 of which harmonize in the perfection of angels with a country accent. The guitars are complemented nicely by a mandolin, banjo, steel guitar and an accordion. The gel that binds them all is the voice of lead man Zach Williams, who packs enough soul to bring the whole train back (see what I did there?). If you don’t feel the hair on your neck stand up at some point in this 4:57 of beauty, you need to have someone check and make sure you have a pulse. From the very start of the song I knew I was in for something beautiful. It starts off with some low harmonies and this is just foreplay for my eardrums. The song ebbs and flows finally culminating at a full blown eargasm between 2:52-3:19 and then blows your mind again from 3:37-4:02. They even leave you with a little pillow talk to round out the final 55 seconds of the song. They have a debut album coming out tomorrow. Get it. My only question for them now is, when are they touring within a 100 mile radius of Raleigh so I can get a ticket? !